More information can be found on the USA Curling website, as well as via their Twitter account, Facebook page and Google+ page. P.S. And yes, the only coverage now is on NBC Sports Network. There was a free live stream on the web but that was for all the games up until the playoffs. 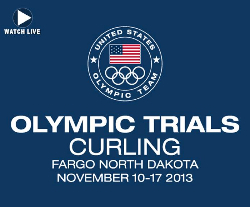 This entry was posted in US Curling Association and tagged Olympics on November 15, 2013 by Dan York.